World Peace in My Lifetime? There are many ways in which the world has gotten better. Setting aside the fact that I can access almost the sum of human knowledge from a small rectangle in my pocket (but I use it to look at pictures of cats): expected human lifespans are skyrocketing across the globe, artistic and cultural achievements from every corner of the planet are available almost everywhere, and people still yearn for greater fairness despite the fact that this may already be the lowest ebb of inequality humanity has ever achieved. One of the culprits for this peak may be the penetration of free markets, but it’s hard to experimentally prove that, and I’m not sure it’s worth it. Whatever case, here’s a great peace about the greatest amount of peace humanity might have ever known, of which I offer an excerpt below. Here’s to world peace in our lifetimes. But, as one of my favourite statisticians Hans Rosling says — you have to be able to hold two ideas in your head at once. The world is getting better. But the world is not yet good enough. It’s important to acknowledge one of the great stories of our time. We are very lucky. Fewer of us as a proportion of the world’s entire population have had to go to war than any other generation since the Roman Empire. Surely that’s something that should be celebrated as part of our public discourse? When we speak about the decline of war, we have an opportunity to express our gratitude to those who came before us, and sacrificed so much for the principles of peace, and freedom from persecution. Our relative comfort and wellbeing is a direct result of their sacrifices — and by saying that the world is getting worse, we dishonour their memories. War is not inevitable. Many brave people have fought for that belief. Our generation is starting to show that it’s possible. And the more people start understanding that, the sooner it becomes a reality. Presented with little comment, but first I must note that the data visualization is brilliant. I encourage you to click through to FiveThirtyEight before reading on. A huge proportion of decisions to actually commit suicide are decided upon a few minutes before the actual attempt. Those who choose guns die at a much, much, much higher rate. In addition, they can’t change their minds, whereas many other suicide attempts are recoverable for a while. If this is even a possibility for you – if you go extremely dark places when drunk, or by yourself, or whatever – maybe consider taking proactive steps when you’re in a good place and make it difficult for you to load your gun when you’re in that pit. I’d ask you to get rid of the gun, but those of you who I know would simply never do that. Instead, for love’s sake, give yourself those crucial few extra minutes to change your mind. Hat tip to this reddit post. Are We Simply a Violent Nation? In the US, we don’t just put a gigantically greater proportion of our population in prison, we don’t just sentence folks to death at a ridiculously higher rate, our forces of law and order also kill suspects at almost 200 times the speed than in any other first-world nation. Some blame how easy guns are to obtain, some the racism intrinsic to the justice system, some the impenetrable solidarity among police officers, some the delegation of enforcement to community-level agencies with whatever training they can afford and are willing to take on. The truth, as always must be somewhere among all of these, and to absolutely deny any of them is to assert that we are, in that measure, simply a violent people that loves to kill each other, kindred to Itchy and Scratchy. WHAT HAPPENED: The Federal Government has a law that prohibits any person with a domestic violence conviction from owning a firearm. The specific text of the statute does not specify a mental state, but subsequent cases have held that Federal Courts require a person to exhibit a “knowing or intentional” mental state to be convicted of assault. The defendants in this case where found to be in possession of guns with past convictions for domestic violence under Maine law. WHY IS THIS BEFORE THE SUPREME COURT: In the most general of senses, this case is before the Supreme Court over the legal concept of mens rea. As stated above, federal statutes require that a person convicted of assault have a high mental state, whereas Maine allows a person to be convicted of assault when the mental state is “knowing, intentional, or reckless“. The addition of “reckless” is key, because that is a lesser mental state than the federal standard. Defendants therefore argue that the additional lower mental state makes all Maine citizens convicted of assault ineligible for the Federal statute. In a specific sense, this case is about the Second Amendment and everyone getting frantic about a Justice doing an optional activity with little consequence. During the oral argument, Justice Thomas asked questions about whether or not it is Constitutional for a misdemeanor conviction to deny someone their Second Amendment rights. Thomas argument is that mens rea aside, this statute is unconstitutional because it puts an undue burden on a person’s rights to bear arms. WHAT ARE THE RAMIFICATIONS? Should the defendants win on any grounds, the ramifications are that domestic violence offenders are allowed to possess guns, which is probably bad unless you’ve lost most perspective on gun rights. Should the State win, you could argue that the federal government’s ability to criminalize conduct is expanded, but this probably applies to only a few States and one specific crime. In all honesty, this is likely just an example of the Court clearing up an issue with a statute that should have been written more clearly from the onset. ROOT FOR VOISINE IF: Seeing the “forest for the trees” is more important than perpetuating domestic violence. ROOT FOR U.S. IF: Preferring a “means to an end” is more important than strictly abiding to the Constitution. WHAT HAPPENED: Whitfield is a criminal defendant who was charged with a calamitous robbery, which took Whitfield from a Federal Credit Union through the houses of neighboring residents. While in the home of a nearby bystander, Whitfield asked the bystander to nominally move throughout the room the neighbor was found in. The neighbor moved slightly but remained in the home. Because of these actions, Whitfield was indicted with the aggravated charge of forcing a third party to accompany the defendant during a robbery. WHY IS THIS BEFORE THE SUPREME COURT: The Due Process clause of the 5th Amendment requires that criminal laws are fairly specific, so that a citizen could not be found guilty of conduct that they were unaware was a crime at the time it was committed. This is usually phrased on the context of “vagueness”. Whitfield argues that the phrase “accompany” is unconstitutional vague because the word could represent any kind of movement, as evidenced by Whitfield’s liability in this case. Whitfield only asked the third party to move nominally around the house and did not force the third party around like a hostage, which one would assume was the focus of this aggravating crime. WHAT ARE THE RAMIFICATIONS OF THIS DECISION: This case would affect the Court’s ability to interpret criminal statutes, but ultimately is fairly limited to the scope of this particular statute. This case has some connection to Johnson v. U.S., which deals with the Court’s ability to interpret criminal statutes to their liking. WHAT WAS THE RULING: The Court ruled 9-0 in favor of the government and upheld Whitfield’s conviction. Justice Alito wrote the opinion stating that the word “accompany” included any form of movement, and stated that the amount of movement in the Whitfield case satisfied the statute for which he was convicted. THE GOOD GUYS WON IF YOU: are a fan of common sense and Webster’s dictionary. THE BAD GUYS WON IF YOU: are a bumbling bank robber, or are a criminal defense attorney who represents bumbling bank robbers. WHO WAS RIGHT: This case was decided prior to recording, but both Brett and Nazim agreed with the holding. WHAT HAPPENED: Johnson is a criminal defendant who faced heightened penalties under the Armed Career Criminal Act. The ACCA is a statute that serves to give higher penalties to habitual offenders based on the amount of violent felonies that the defendant has on his/her record. Johnson was charged under the ACCA due to a charge of Possession of a Short-Barreled Shotgun, which has been historically classified as a violent felony for habitual sentencing purposes. WHY IS THIS BEFORE THE SUPREME COURT: The Due Process clause of the 5th Amendment requires that criminal laws are fairly specific, so that a citizen could not be found guilty of conduct that they were unaware was a crime at the time it was committed. Johnson argues that the ACCA’s classification of “violent” felonies is unconstitutionally vague because Johnson is facing a heightened charge based solely on possession of an object, which in a vacuum is not violent and can be legal in certain circumstances. The United States argues that short-barreled shotguns are overwhelmingly used for violent purposes, and therefore the government’s classification of possession alone as a “violent felony” is appropriate and supported by history and precedent. WHAT ARE THE RAMIFICATIONS OF THIS DECISION: The interpretation of violent felonies for purposes of habitual felony statutes could be at issue, which could have an effect on whether or not drug charges can be classified as violent felonies. If the Court holds that possession of one type of gun is not inherently violent, it could be argued that possession or the sale of drugs is also not inherently violent since it is not in itself a violent action. This argument is a stretch since drugs have a strong link to violence; however, it wouldn’t be the first time that the Court gave someone an inch and they tried to take a mile. WHAT WAS THE RULING: This case is not yet decided. YOU ARE ROOTING FOR JOHNSON IF: you have a career that generally involves lying and being a horrible person………or you are the criminal who is being represented by that person. Thank you, thank you very much. Don’t forget to tip your waitresses. YOU ARE ROOTING FOR THE U.S. IF: you support broad usage of habitual offender statutes. WHO WAS RIGHT: Both Brett and Nazim believed that U.S. will win the day. 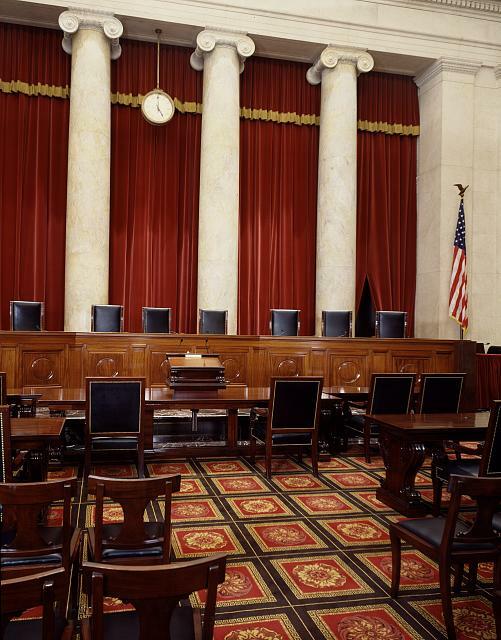 Main Chamber of the US Supreme Court. Source: Photographs in the Carol M. Highsmith Archive, Library of Congress, Prints and Photographs Division. WHAT HAPPENED: Washington, D.C. passed local statutes that put significant limitations on the private ownership of handguns. While citizens could own handguns, a person’s ability to obtain a permit was severely limited and owners had to disassemble handguns even in the owner’s house. 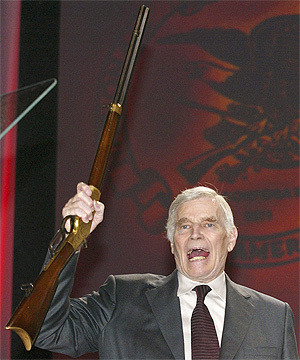 Heller was one of a collection of persons who sought to overrule the statute because they couldn’t get/own a gun. WHY IS THIS BEFORE THE SUPREME COURT: The Second Amendment preserves everyone’s ability to “bear arms”, but frankly, bear arms could mean anything from your ability to serve in a militia or your ability to possess guns even if you aren’t mentally or legally fit to own a gun. After leaving this decision up in the air for 50 some-odd years, the Supreme Court took this case to properly interpret the meaning of the Second Amendment approximately 275 years after the amendment was first written. WHAT ARE THE RAMIFICATIONS OF THIS DECISION: The interpretation of the Second Amendment mostly; however, the decision of the Court was a little narrower than you may expect. The Court was most aptly determining whether or not a City or State could outlaw the private ownership of handguns, within reasonable limitations such as requiring permits or concealed weapon permits. So while the decision prevented the government from banning private ownership of guns, it did not authorize the universal ownership of guns, Mad-Max style. WHAT WAS THE RULING: The Court ruled 5-4 in favor of Heller and held that the Washington could not bar the private ownership of handguns in the manner that was done in this case. Justice Scalia wrote the majority opinion which stated that the Second Amendment guarantees the right to possess a gun independent of one’s participation in a militia. In usual Scalia fashion, the majority opinion focused on the history of the Second Amendment and the purpose of the law at the time it was drafted. The Court stated that citizens have the right to possess handguns, which are the most popular firearms in America, and the Washington statute created an unreasonable burden on that right. The dissenting opinion, written by Justice Stevens, stated that the majority decision was inconsistent with precedent and was an unreasonable upheaval of the law. This decision was the first time that the Court preserved that right and the dissenting opinion did not see a reason why the Court made this decision at this point in time. THE GOOD GUYS WON IF YOU: legally own guns and feel strongly about the private ownership of guns even if millions of people die from them every year. THE BAD GUYS WON IF YOU: are OK sacrificing freedom for security. WHO WAS RIGHT: Hard to say really. Brett believed that States should have the right to do what they want, whereas Nazim had a hard time getting past the thought of technology being included in the Constitution. Since neither of those considerations were addressed by the Court, let’s say it’s a loss for everyone.